Behind closed doors, Pinky’s Bakeshop is whipping up a new, modern concept: high-end pâtisserie spiked with South Asian tastes. Phingky Fuentes never dreamed of owning her own business. She simply knew she loved to bake and wanted to make it her career. 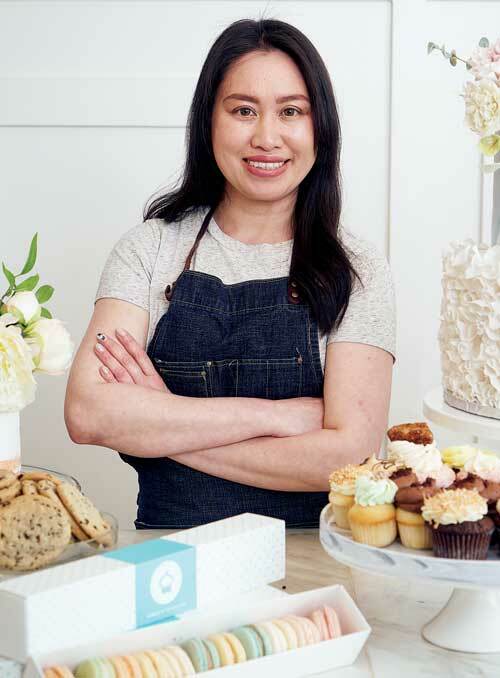 First introduced to Western-style baking when her family immigrated to Riverton, Manitoba, from Thailand in 1991, Phingky and her mother learned how to bake cookies and cakes from their sponsor, an avid baker. She recalls being an 8-year-old girl watching her mother in the kitchen, filling the home daily with the scent of cinnamon buns, and feeding the budding baker’s passion for dessert. Today, Phingky’s lifelong love affair with pastry manifests in the array of glorious goodies on offer at Pinky’s Bakeshop, the sweet little spot nestled at the corner of Osborne and Stradbrook. Rows of macarons, cakes and cookies attract lovers of sweets with alluring colours and exquisite frosting. This assortment is what draws Ciao! to the shop, but our tasting visit offers a glimpse at something different ready to emerge. In an industry where image and originality are so important, change is often necessary. As a burgeoning number of new opens join the city’s main-stays each year, the competitive landscape for Winnipeg’s restaurants and bakeshops is ever-increasing, and while a blessing to customers, it poses challenges and pressures to restaurateurs and shop owners looking for ways to stand apart. Noticing that bakeshops have barely explored North America’s infatuation with Asian fusion, Phingky is breaking away from other pâtisseries by infusing her home country’s savoury flavours into tarts, cookies and cakes. She has discovered that earthy-sweet Ube, or purple yam, lends vibrant violet colour, and other bold ingredients culled from Thai cuisine, like miso, chiles and durian, can make a dessert pop. In fact, over the last few years she has been working to identify which flavours go better with dark chocolate or milk chocolate, and what kind of pastry best showcases the ingredients. While some ideas, like incorporating tapioca balls into a bubble tea macaron, do not work out so well, other combinations lead to something quite delicious. Inspired by the sweet-sour and spicy profile of tom yum soup, Phingky pairs lemongrass and Thai chile with dark chocolate to create the tom yum tart featured on these pages. “I feel like it’s good to branch out from your normal,” she comments. “Instead of lemon, why not use lemongrass?” She is looking to other world cuisines too, blending the middle-eastern tastes of tahini into cookies, tropical passion fruit into cream puffs and pairing spicy habanero chocolate sauce with the beloved deep-fried churro. When she entered the Baking and Pâtisserie Program at Red River College 10 years ago, Phingky had never imagined she would one day be the owner of a trend-setting bakery. “I was actually going to go work on a cruise ship,” she laughs, “but then I met my husband.” She eventually settled down in the city, working at Lilac Bakery. Then, in 2013, the owner of The Cupcake Corner decided to sell the business. Phingky was a close friend and in the spur of the moment purchased the little bakeshop. Over the next year, she learned the ins and outs of managing a business while continuing under the existing brand, baking cupcakes. Throughout the first year of running the company, Phingky began to develop a vision for the future. “It was time to change, time to expand, time to go outside of our box,” she says, “a little bit out of everybody’s box.” In 2014, she rebranded to Pinky’s Bakeshop, expanded the menu to include a more diverse offering of cakes, cookies, slices and macarons, and started her flavour experiments. The cute wainscoted white walls accented by colourful cupcakes will soon be replaced by modern teal and white tiles, and the new Pinky’s will emerge. Alongside a selection of spicy tarts and tropical chocolate choux, she will also be adding a coffee menu, quick breads and an ice cream machine to help expand the offering of macaron ice cream sandwiches upon reopening at the start of May. A competitive market can be tough on a small business, but it can also nurture innovation. Discovering her voice as a Thai baker, Phingky is confidently setting forward to showcase her world-infused menu in a contemporary-style space.